In early 2009 I was really happy to finally be able to add a nice big 1:18 scale model of the very first Lamborghini production model to my collection, a red 350 GT made by Ricko, a stylish Gran Turismo with a massive 3.5 liter V12 up front in real life and all the comfort you would expect from a high end automobile like this back in the early Sixties. 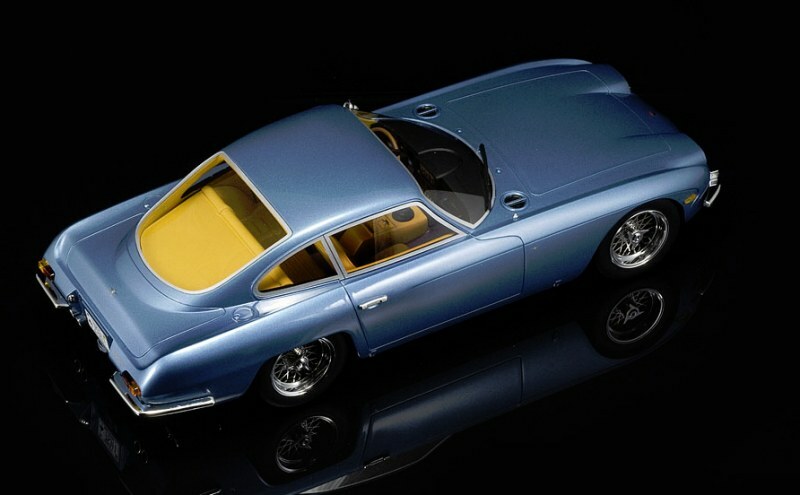 Fast forward to late 2015, and much to my surprise, I see a new 1:18 model of the Lamborghini 350 GT being listed, this time from CMR or Classic Model Replicas. 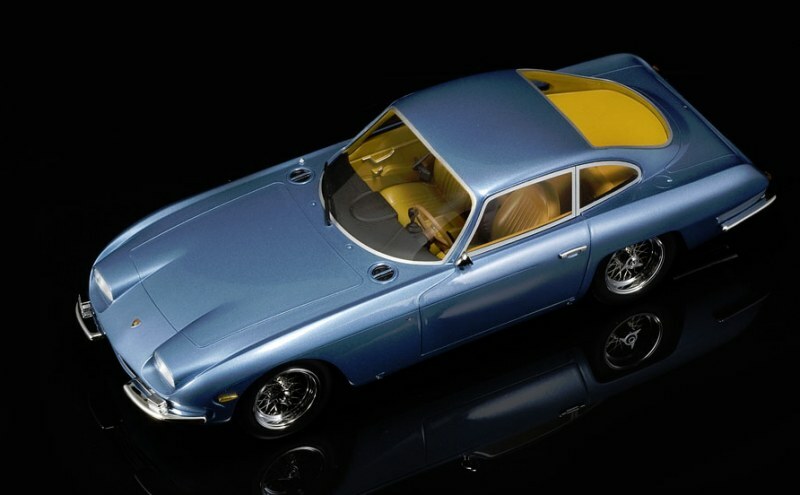 Unlike the all opening diecast from Ricko, this one seems to be a sealed resin model, finished in a very classic light blue metallic over a warm brown interior. 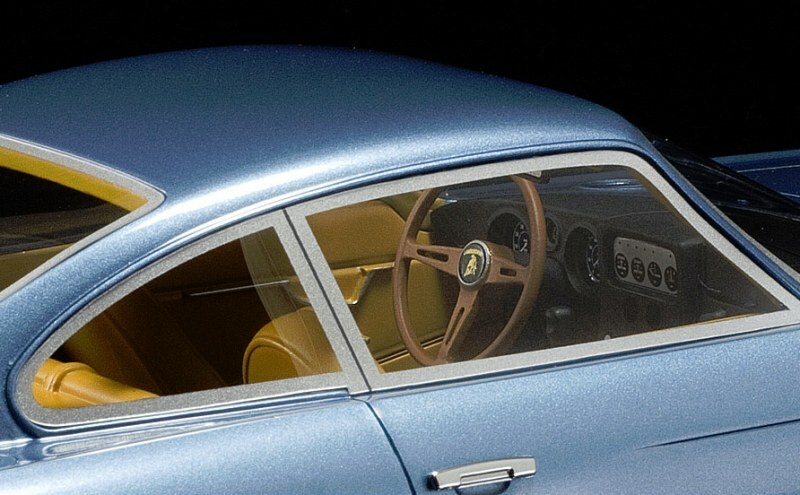 Listed at €99.95, I only hesitated for a minute to put in an order for a model of the car that marked the start of the impressive history of Automobili Lamborghini SpA. A history that has already taken over 50 years in the making. Today the factory in Sant’Agata isn’t building fast GT cars anymore, but extreme exotics. Back in 1963, the late Ferruccio Lamborghini founded his car building company after a dispute with Enzo Ferrari. Ferruccio would show the world he could do a much better job at building a high speed Gran Turismo car that would be comfortable to drive and reliable, all the while offering impressive acceleration and top speed from a bespoke V12 engine. 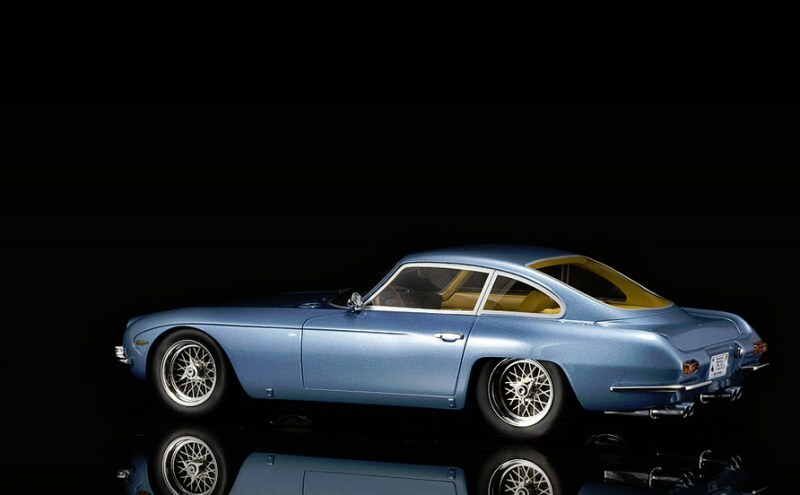 After the 350 GTV (for Gran Turismo Veloce) which was only a prototype, the Lamborghini 350 GT was introduced at the 1964 Geneva Auto Show, showing inspiration for cars like the Jaguar E-Type. 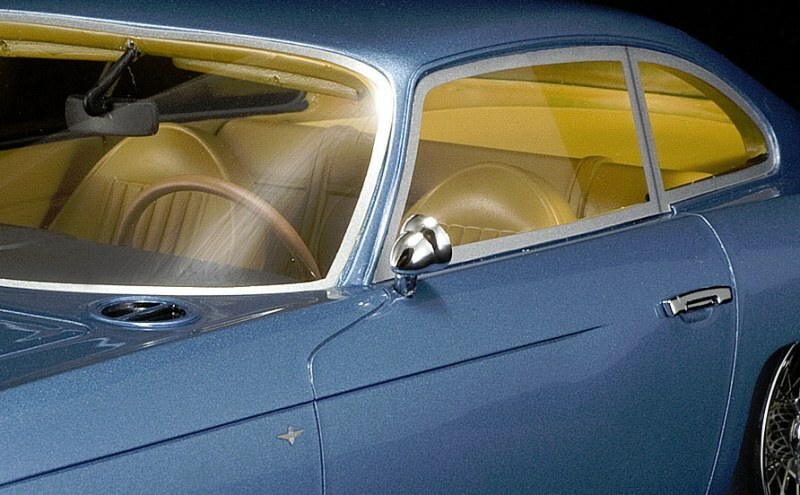 The first Lamborghini car to be built had a very elegant design, a long front section, two doors that led into a cabin with only two seats (behind the seats a shelf was made to put additional luggage, complete with leather straps to hold the suitcases in place). 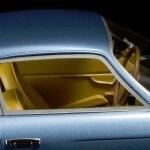 Do note that a very small number of Lamborghini 350 GTs came in a 2+1 configuration. Behind the two front seats a single, center mounted seat was mounted. 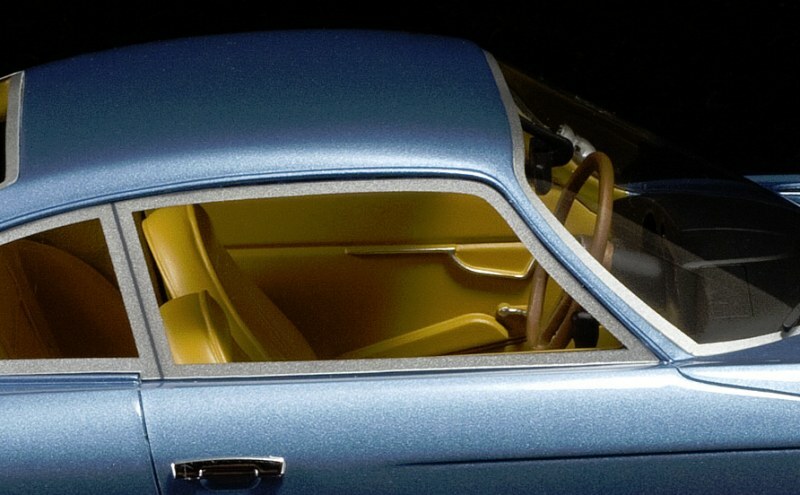 It didn’t offer too much room for a third passenger, and Ferruccio didn’t like this setup because it wasn’t up to his required level of comfort. 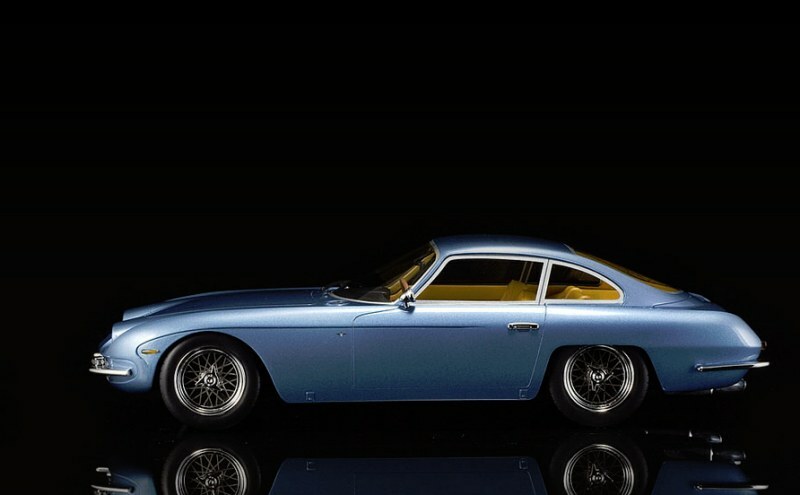 The bodywork of the Lamborghini 350 GT was built by Carrosseria Touring, who used their trademark Superleggera method of spanning aluminum panels over a skeleton to form a very lightweight, but still strong body, hence the ‘Superleggera’ logo on these early V12 GT. Too bad CMR didn’t put this logo on the engine cover of their scale model where it should be featured. CMR did put it on the luggage compartment cover together with the stunning Touring logo, which are also mounted on the side panels behind the front wheels. 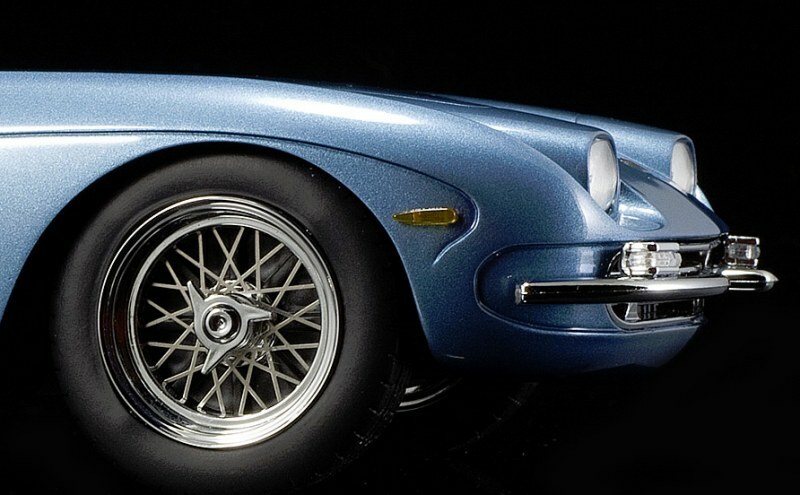 Further logos on this CMR model are naturally the Lamborghini 350 GT scripts on the right side of the rear panel between the headlights, and the Raging Bull crest up front between the two oval headlights, but there is something strange with this logo. 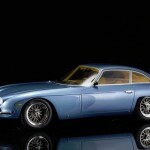 CMR lists this model as a 1967 Lamborghini 350 GT, which is a bit odd to be honest, as the 350 GT was built between 1964 and 1966. 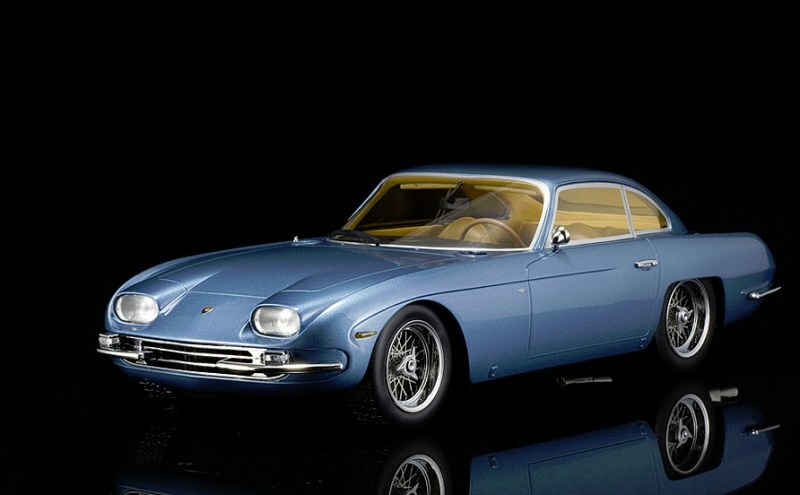 In late 1966, Lamborghini offered an enlarged 4.0 Liter V12 in this model, making it the 400 GT, while in 1967 two seats were added to a slightly longer wheelbase model called the 400 GT 2+2. 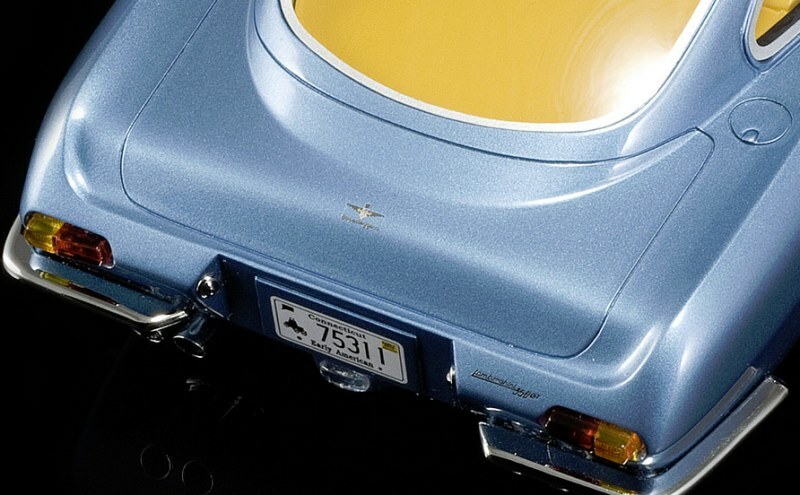 So there isn’t really a 1967 Lamborghini 350 GT, and even if there would be an actual very late production model that was only registered in 1967 to make this claim from CMR valid, it wouldn’t have this logo up front. The very first Lamborghini cars to leave the factory in Sant’Agata back in 1964 didn’t come with the gold Raging Bull on a black background like we all know today. A small number of cars were shipped with a two tone logo featuring the Raging Bull in gold but on a background with red at the bottom and white at the top in a diagonal division. Very, very rare. And while CMR tried to copy this design, they failed by putting red at the top and black at the bottom. 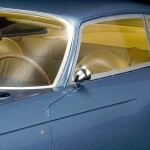 Also note that the early Lamborghini 350 GT came with a single front bumper and a different intake treatment. In 1966, the split bumper and grille with three horizontal intakes as seen on this CMR scale model were introduced. Another detail CMR didn’t get perfectly right are the wheels. 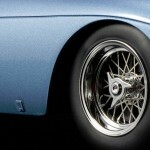 The Lamborghini 350 GT came with extremely nice Borrani knock-off wheels. 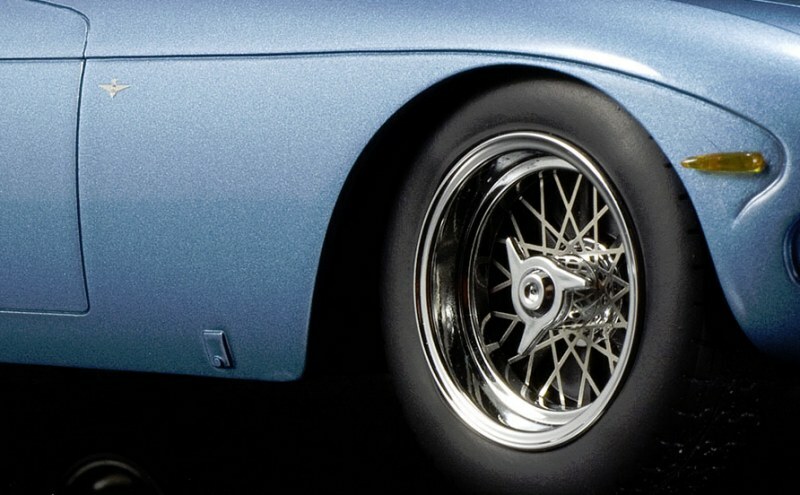 However, the real wheels held 72 spokes in a very intricate design. 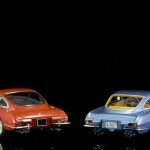 The CMR scale model comes with 26 spokes only, so quite a few are missing on this 1:18 scale model. One thing I really admire on this model are the actual scripts and logos CMR installed. I do think these are metal, but CMR applied a clear coat over the entire model after these were mounted, which makes cleaning this model so much easier without you having to worry about taking the logo or script from the car with your cloth. 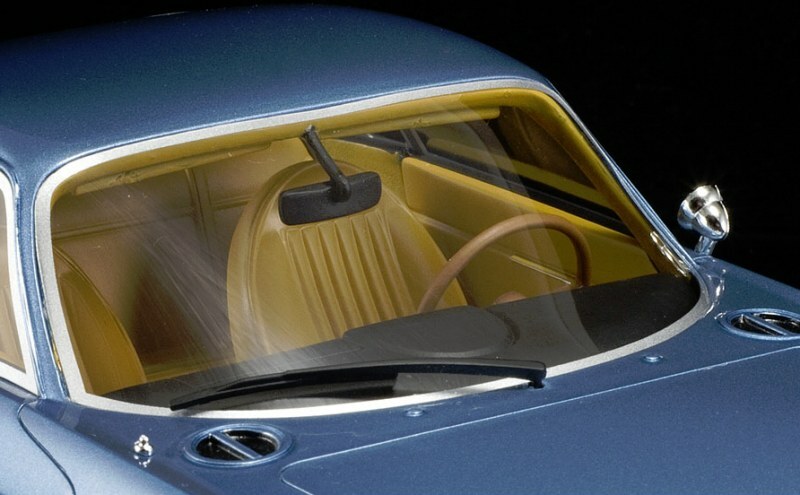 Two more items on the outside aren’t completely right when compared to the real car, the two round vents in front of the windshield should be chromed or polished steel, and that single windshield wiper just isn’t black on these Lamborghini from the 60’s either. 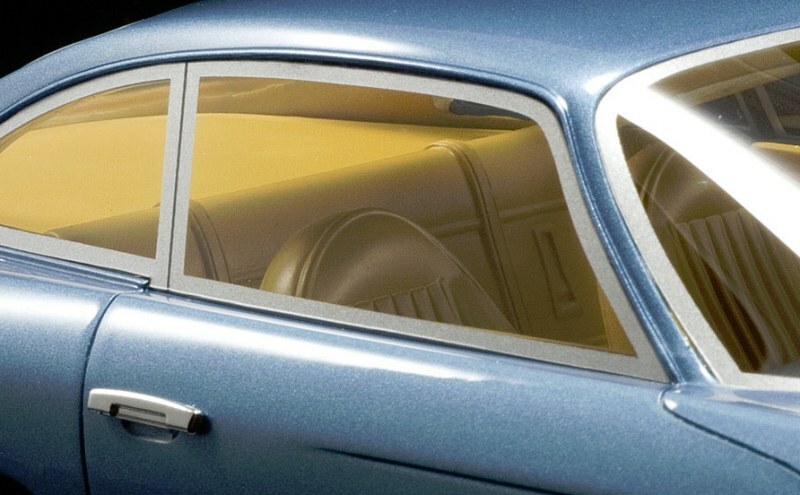 So let’s take a closer look at the interior through the windows naturally, as this is a sealed model, nothing opens, but I knew that beforehand, so no need to make a remark about this. 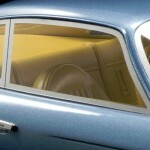 The warm brown shade of the interior does look very nice, and totally correct inside a 350 GT. Many of these V12 GTs were delivered with this leather interior. If you take a closer look at the central console, you’ll notice the four dials inside a brushed aluminum plate. 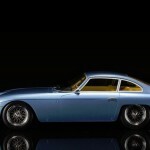 On the real car, this would be leather from 1966 on, only the pre-1966 350 GT had this aluminium plate. 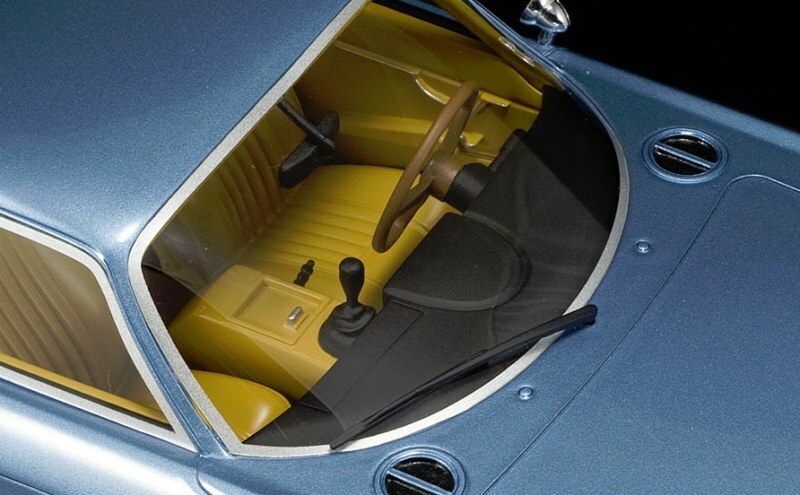 Another small detail is the steering wheel. Back in the day, this would be a stunning wooden steering wheel with three metal spokes. It would have been nice if CMR would at least have painted the spokes silver to make it look closer to the original. So how does this new, €100 model from CMR compare to the diecast version from Ricko that was sold at around €60 when it was new? Today these Ricko models do tend to be more expensive. The last one I found was listed at €120. The red 350 GT on the left side of this photo is the one from Ricko I’ve owned since 2009 already, and while it clearly is not as finely detailed as the new 2015 model from CMR on the right, I have to admit she does look really, really nice for her age and original price. 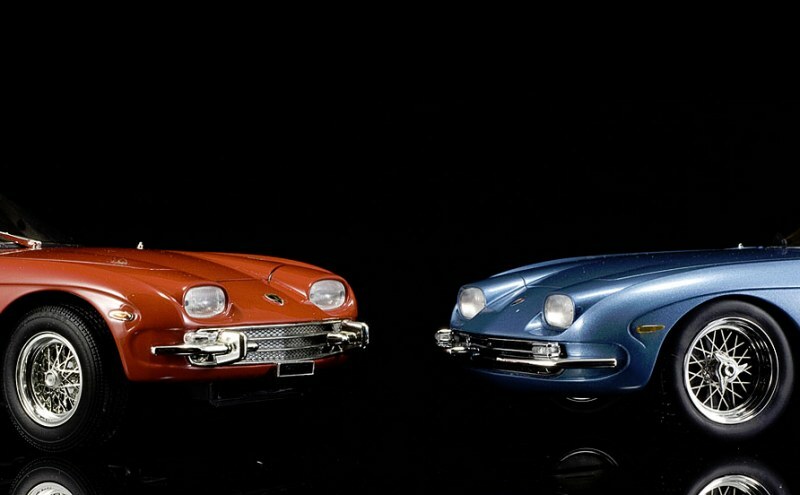 Both models are roughly the same model year if you ask me, both come with only one windshield wiper and have the same, split front bumper design. 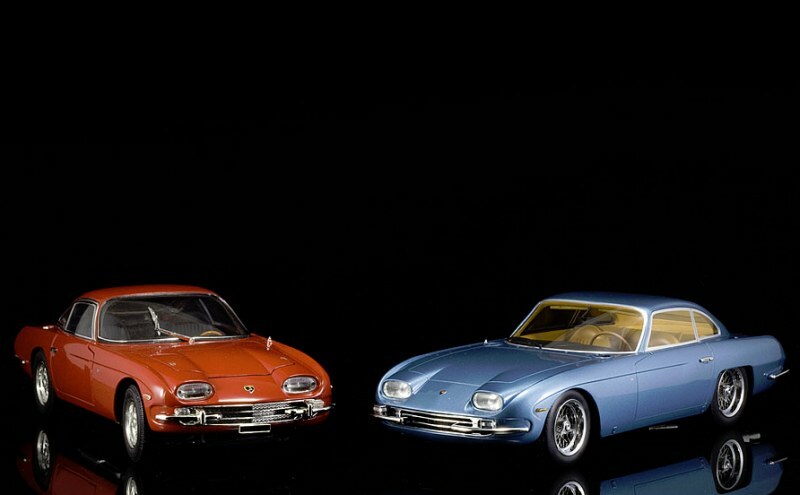 However, the red one comes with ‘overrides’ on the bumpers, which was used on several original Lamborghini 350 GT in real life too, so both treatments are correct in fact. 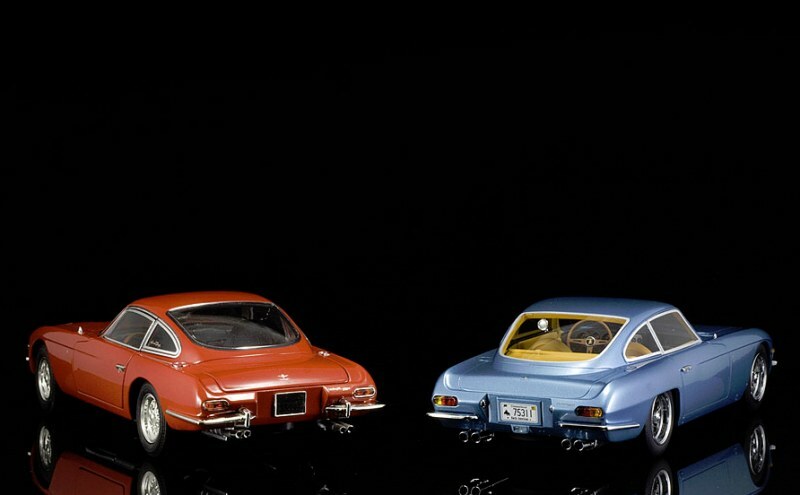 It does look like the Ricko model sits a bit higher on her suspension, in fact I do get the impression the blue Lamborghini 350 GT from CMR is a bit smaller overall. 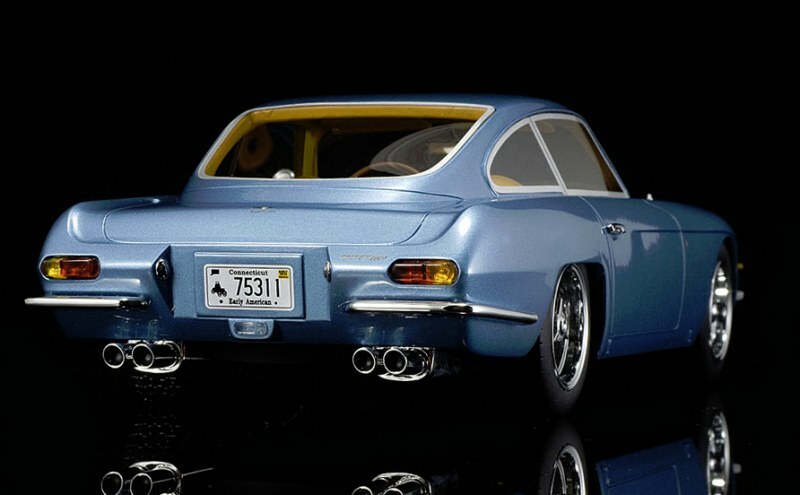 At the rear both models look very much alike in fact, the Ricko model comes with the chrome taillight surrounds, but those weren’t featured on all Lamborghini 350 GT in real life, so again, both Ricko and CMR did get it right. Also note the area underneath the license plate … the CMR model comes with the reverse light in that spot, something Lamborghini only added from 1966 on. One small detail is obvious too when we take a closer look at the rear of both models, specifically the blue CMR model in fact, note the license plate is from Connecticut in the United States … but the taillights are the two tone European versions. 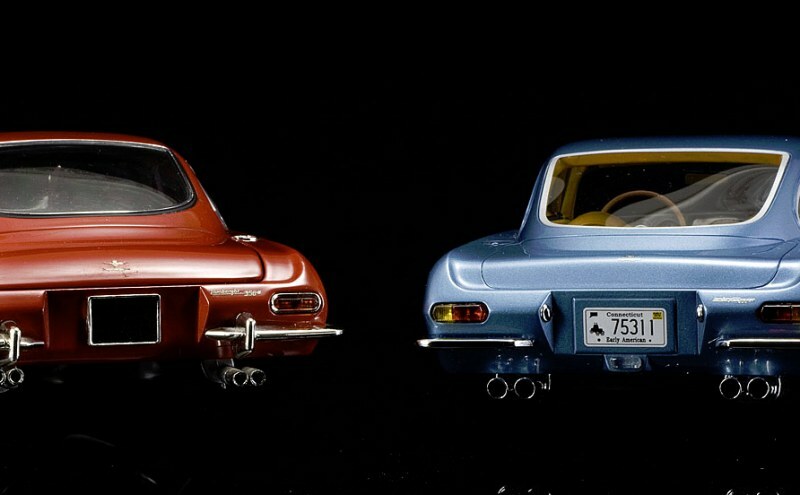 The Lamborghini 350 GT that were sold in the United States came with solid red taillights back in those days. 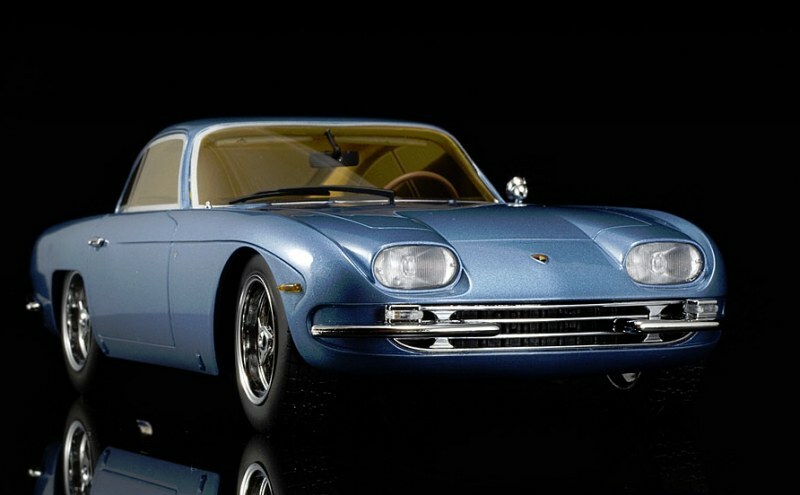 So there are a few details CMR just didn’t get right on this 1:18 scale model of the very first Lamborghini production model, but should that keep you from adding this model to your collection? 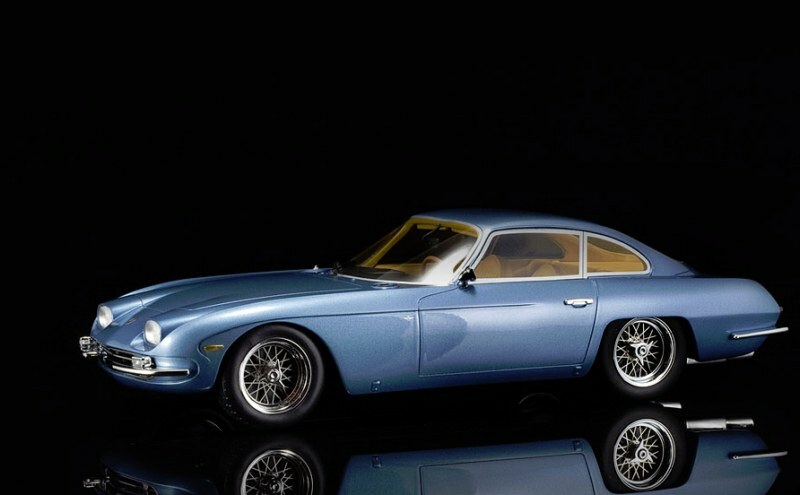 For me these aren’t keeping me from proudly displaying this new model in my collection, and it sure wouldn’t have kept me from buying this blue metallic Lamborghini 350 GT either, so I still think it a very nice addition to my scale car collection. 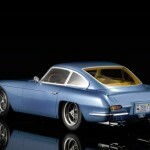 I already imagined CMR based this model on a real car because of the license plate, a bit of searching around showed me that there is in fact an actual Lamborghini 350GT in the United States with license plate 75311 registered in Connecticut … she was on display back in 2008 during the Greenwich Concours Gallery, many thanks to Richard Owen from Supercar.net for this image. 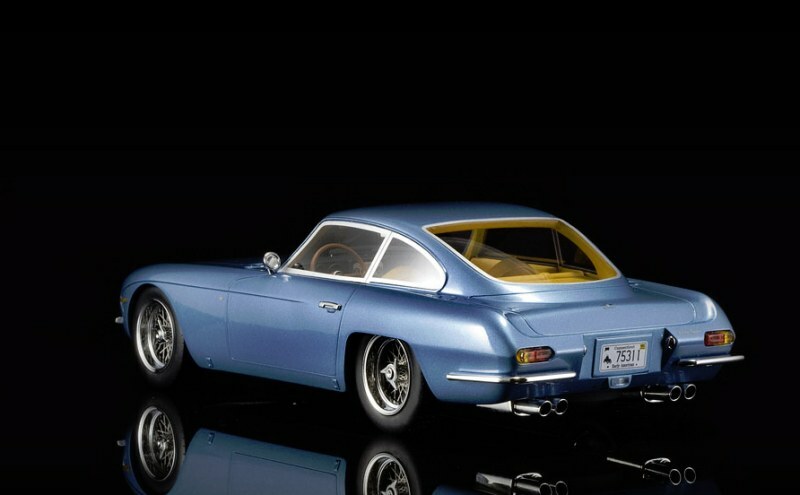 5 Responses to "REVIEW: Classic Model Replicars Lamborghini 350 GT"
I don’t think you can rate a car based on the logos being correct or not. It is probably wrong on every model you buy. And many modellers put their own license plate on a model, so no points lost there either. The wheels are a bad miss though and I also notice that we can see the interior between the jambs and the silver (paint?) trim. The chrome trim on the Ricko does look a lot better, but didn’t they make a mistake with the rear wheel arches? I agree as well. The biggest failure are the wheels and the trim is close second. 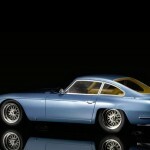 For these reasons I’m passing on the model, a shame, I love the timeless lines. I have the first CMR car- the 1938 Mercedes W125 speed-record Streamliner. 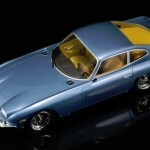 It is a beautiful model, pure form as part of function. It is mounted and presented beautifully. I think it is a stunning model. 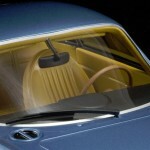 My only complaint is that the windscreen seems much too thick. But, it looks great on a bookshelf regardless. They were on the right track here. Really missed on the 350 GT.